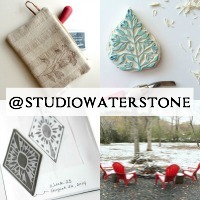 Studio Waterstone | Lori Plyler Art: tutorial: a scarf from wool pants? absolutely! tutorial: a scarf from wool pants? absolutely! 2) Make sure you don't have a scratchy pair of pants (ow). 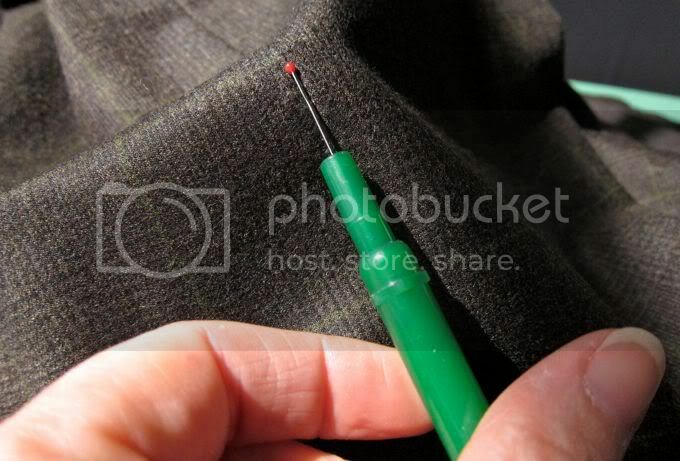 Use a seam ripper to open the outside and inside seams. 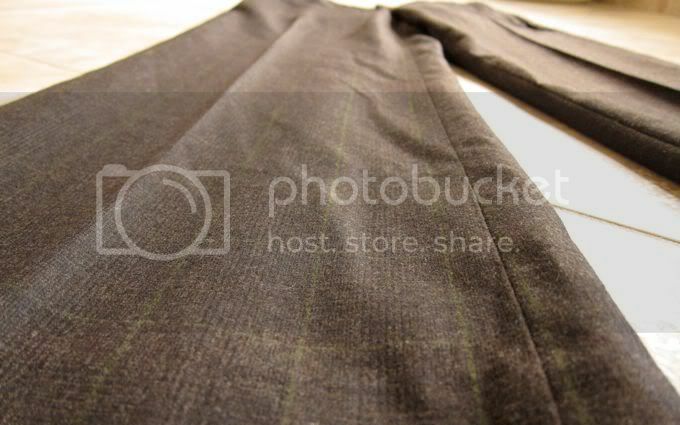 After ripping the outside and inside leg seams, cut off the waistband so that you are left with four long panels. Cut the panels as long as possible and about 9" wide. These measurements are not carved in stone. You can use about three lengths (end to end) for a longer scarf and two lengths for a shorter scarf. Once cut, press your panels. That's it for the construction! If you'd like fringe at the ends this is where, once again, the pinking shears come in handy. Cut about 4-6" strips on each end, about 1/2" wide. Dig out old fabric scraps and buttons. Begin cutting flowers and leaves. If you aren't comfy cutting flowers, then cut circles. Arrange on each end of the scarf and pin. 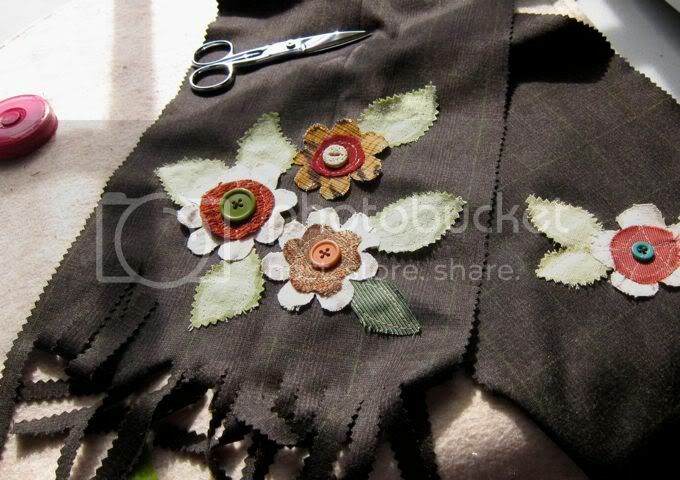 Stitch each flower and leaf into place. 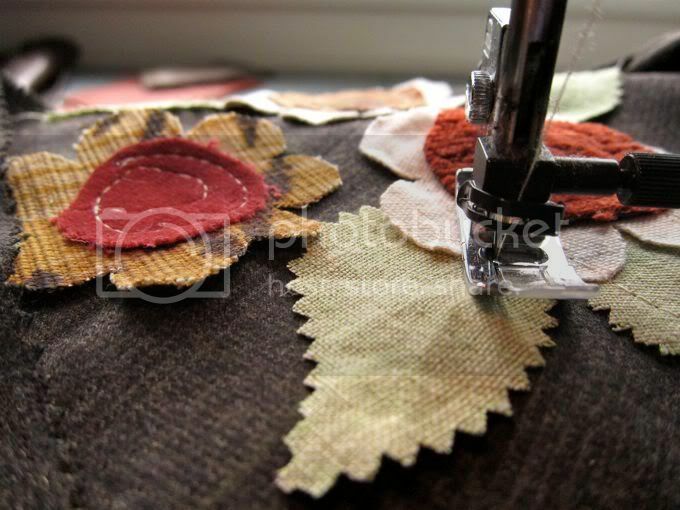 Have fun with your stitching because we're going to scratch up the raw edges of the flowers and leaves so that they ravel a bit. The more whimsical, the better. Scratch and mess the fabric to your liking. 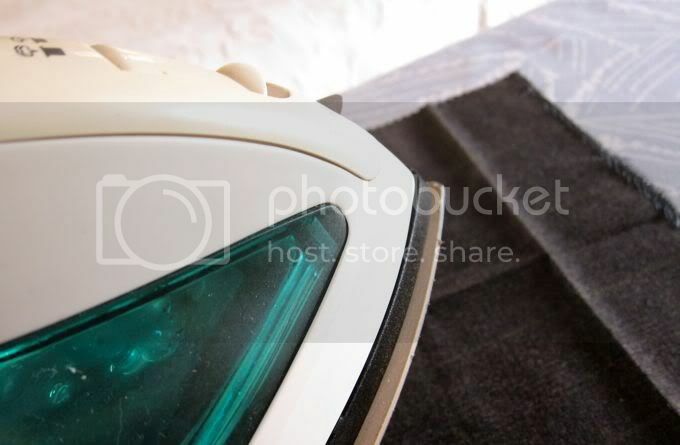 Use your Fray Check to go around the edges so that they'll stop the raveling process. 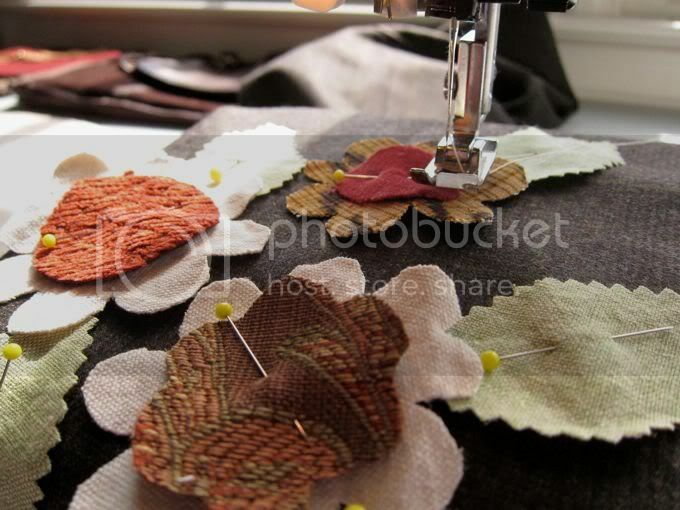 Sew colorful buttons to the center of each flower. 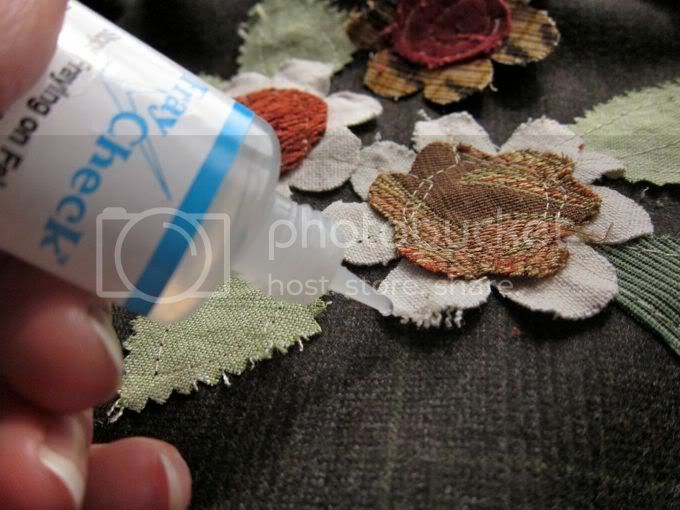 Use a different colored bobbin thread for sewing the flowers and leaves if, like me, you have dark fabric. This way the seams won't show up on the back of the scarf. If you want to take this scarf tutorial to the next level, line the scarf with a bold contrasting fabric. 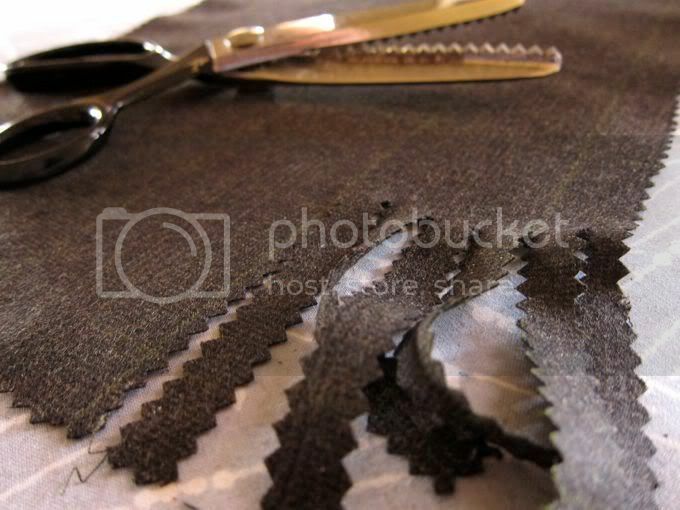 Simply pin both front and back, right sides together, then stitch all around leaving an opening to pull the right sides out. To finish stitch all around the perimeter again with a 1/4" seam allowance. 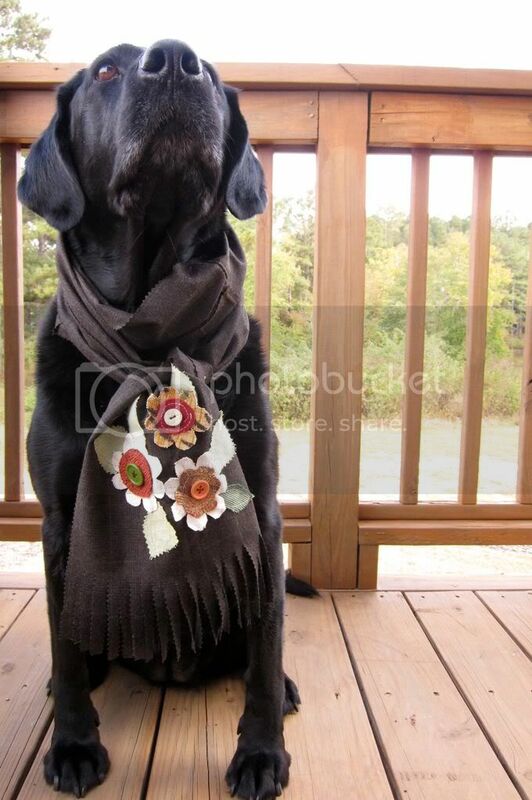 Now you MUST model your fabulous new scarf outside in the crisp fall air with a glass of merlot...or pinot...or as is the case of my model, hot chocolate. ...and a nice piece of raw hide. I love scarves, can't figure out how to wear them right! This one is soo cute! Love, Love, Love! I think I have the perfect pair of pants too!!! Well, isn't that SO clever - and ADORABLE ta boot! I'd totally sport that! Sooo pretty, the flowers really add a visual punch. Great tutorial, you made it look incredibly easy. Love your models :-) very cute! Hmmm, perhaps the next scarf could use a Kelleybeads button or two? You know, Jennifer, I am all over the idea of lining it with green and I just happen to have green cotton!! Thank you so much! 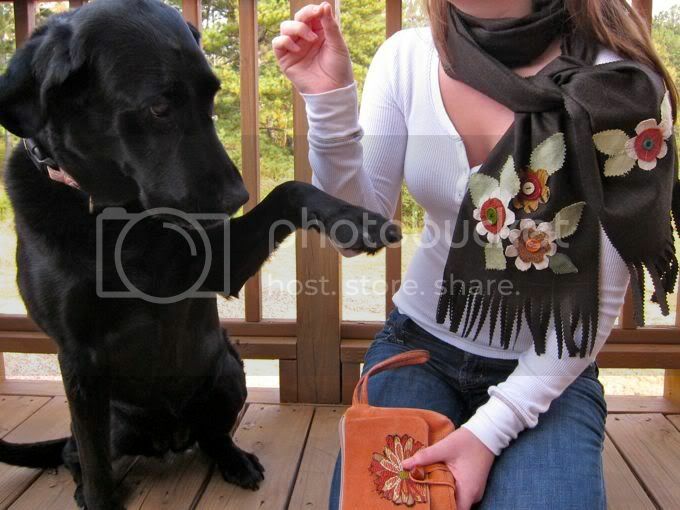 The dog DEFINATELY deserves a scarf!!! This is so cute! Lori do you use a special foot for free hand sewing like that ??? I just read something somewhere about a special attachment - just curious - of course I can't remember what it's called. Yay! You're back! I was wondering where everyone went. lol. Didn't realize my blog wasn't showing up. Anyway, no, I don't have a special foot. Know what you're referring to, but I don't have it. I think it's a free form foot - maybe? I just slowly twist and turn the fabric as I go. 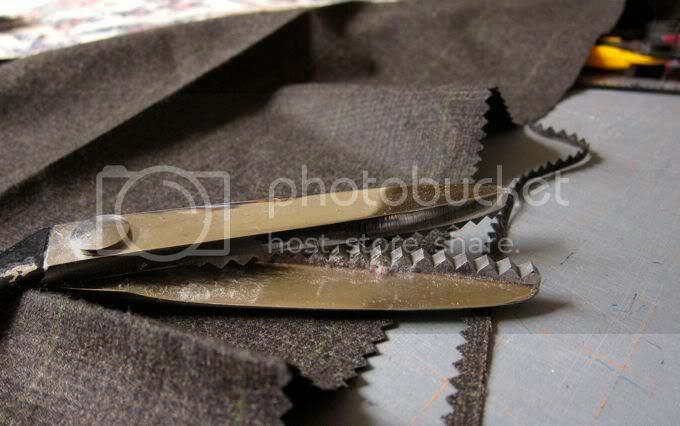 If the turn is too sharp, I pick up the foot while the needle is DOWN and turn the fabric. 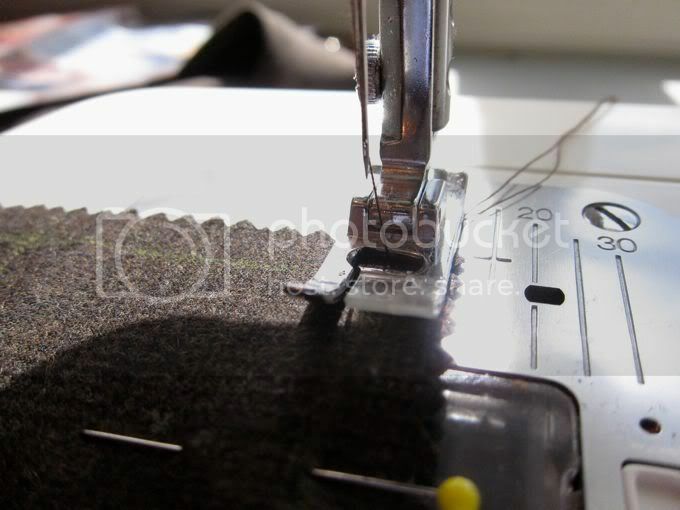 Put the foot back down and keep on sewing.